After bombarding us with cool new phones, from the Samsung Galaxy Fold to the Galaxy S10 5G, Sammy also announced a few new wearable devices with a focus on fitness. 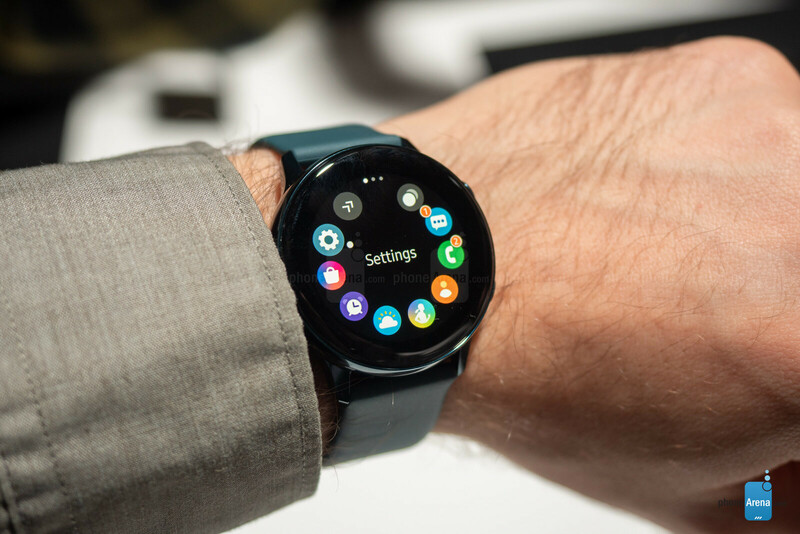 Among them is the Galaxy Watch Active — an accessible smartwatch running Samsung's excellent Tizen wearable OS and packing a bunch of fitness-oriented features. We had some hands-on time with it! The Watch Active is a circle-shaped smartwatch, meant to not look out of place even if you wear it throughout the day. It only comes in one size (40 mm), which may be a bit small for those that are used to expressing themselves with a nice, bulky timepiece, but on the flipside, it can be discrete with not much trouble, and it’s really light, making it easy to forget it’s even on. 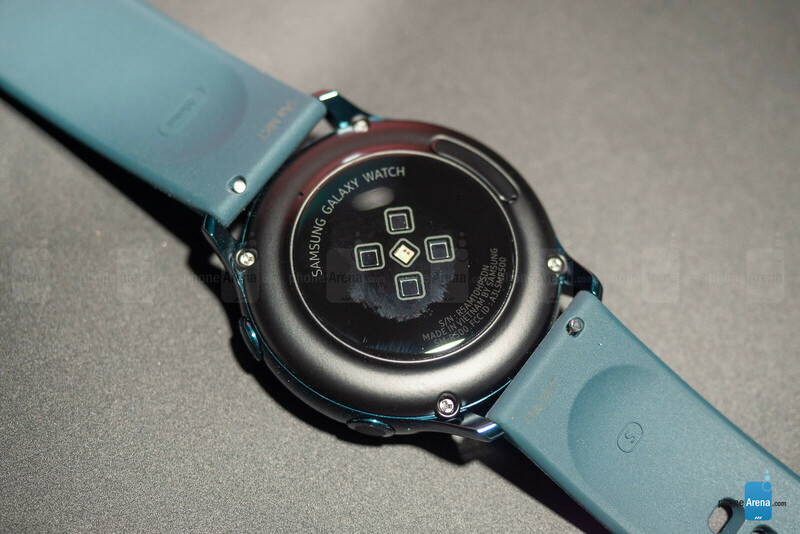 It lacks the rotating bezel of the Gear S and Galaxy Watch series that came before it, so any interaction with the device happens via the touchscreen and side-mounted buttons. However, it does come with a hefty waterproofing, allowing for submersions of up to 50 meters, although, Samsung doesn’t recommend scuba diving with it. The screen is an AMOLED panel with a 1.1-inch size and allows for the Always On watchfaces to shine through, simulating the experience of wearing a mechanical watch. The display is a bit smaller than what we're used to, but it still looks beautiful. 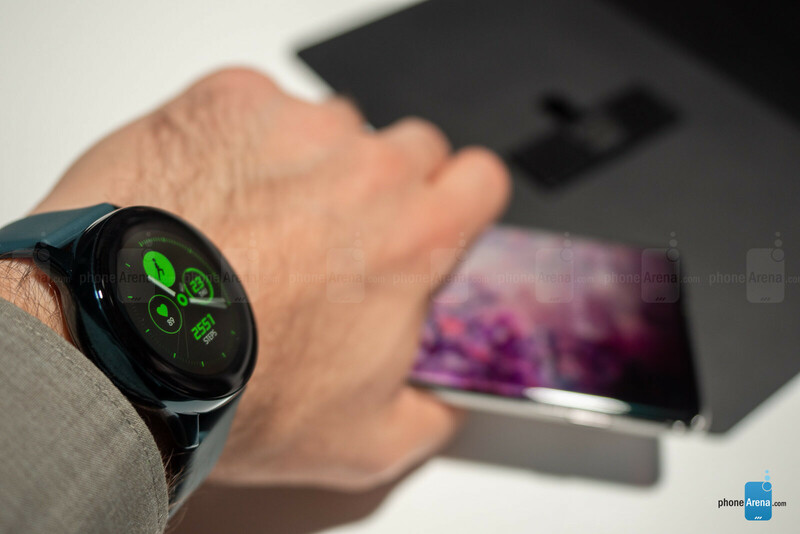 The Galaxy Watch Active runs on Samsung’s own Tizen operating system. It can pair up with any Android phone or even iPhones via the Samsung Wearable and Samsung Health apps. However, in the past, we have found that you can find the most apps and watchfaces for a Galaxy Watch if you have it paired specifically to a Samsung device. In other words, you have the choice of using the Galaxy Watch Active with whatever phone you choose, but you get the most out of it if your handset is a Samsung as well. 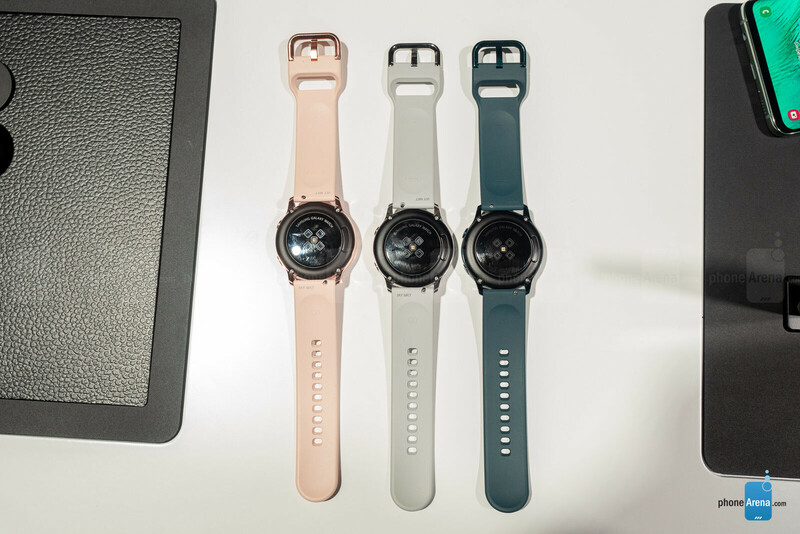 The Galaxy Watch Active can also be seen as a Gear Fit 2 placed inside a body that looks more like a watch. You’ve got a new sensor for blood pressure measurements and the Watch Active can also automatically detect some of the more common activities, such as running, cycling, brisk walk, or swimming. Of course, you can go inside the dedicated workout app if you want to start a custom workout. We’ve also got the heart rate sensor, which will periodically measure your resting heart rate or monitor it during your current workouts. If the on-board fitness apps don’t cover your needs, the Watch Active also supports 3rd-party apps from popular developers like Strava or Under Armour. The Samsung Watch Active is powered by a homemade Exynos 9110 with 728 MB of RAM. Not a lot, but it’s a watch — we thought it ran smoothly for the short hands-on time we had with it. It sports a 230 mAh battery and we expect it to last quite a lot, considering out experience with Samsung’s recent smartwatches. There’s no cellular connectivity to speak of, so no leaving the phone behind for your morning jog. 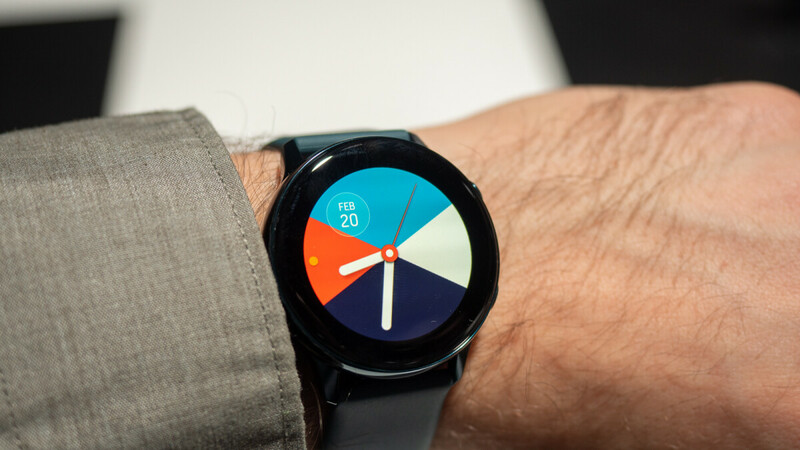 However, the Watch Active does have an NFC and supports Samsung Pay. Note — it’s not MST, so it won’t mimic the magnetic credit card technology as it does on Samsung phones. So, your options for paying with the Watch Active alone are a bit more limited. You will be able to buy the Galaxy Watch Active on the 8th of March and it costs $200. That’s $130 less than your regular Galaxy Watch, which makes this timepiece worth considering. Especially since it doesn’t skimp out on the fitness features and it even has the new blood pressure sensor on board. The problem is that it has a tiny 1.1 inch screen, 60% in area compared with Fossil's and other brands 1.4 inch screens. And 230mAh can't offer more than 2 days of battery life. Of course, this is better than most of the competition, but the big Galaxy Watch can last 4-5 days. I’ll be giving that beauty a try. Excellent lineup Samsung, and the best is yet to come. 5G Note 10. I think the watch looks good. Like a round Apple Watch. Subtle design unlike a lot of other smartwatches. I'd wear it. $200 I might give it a shot. It says it supports Samsung Pay, I assume through NFC, but would it support Google Pay?